On January 23, 2015, Cartoonist Lee turned to his blog to declare his view on Kill Me Heal Me stealing his idea. His main point boils down to the fact that the two dramas are premised upon the romance of a woman falling in love with a man who is suffering from multiple personalities disorder. He supports his position by quoting his legal team, who had advised him that idea theft can be a legal problem in this age. Additionally, Cartoonist Lee even argues that by saying that the extent of similarities not being found as theft or plagiarism is insulting to the webtoon industry. Cartoonist Lee continued to point at the scandal between You From Another Star and Cartoonist Kyung Ok Kang. From a quick search, it seems that Cartoonist Kang accused You From Another Star of copying her manhwa Seolhee. While there was a lawsuit about this issue, it eventually settled out of court so there is no precedent on whether stealing ideas from webtoons/cartoons is considered a violation of copyright or what standard is used to judge such violations. Currently, Cartoonist Lee states that he believes this is a pressing issue facing the manhwa/webtoon community and the community will review the issue accordingly. The producers of Kill Me Heal Me have responded that there is no reason to respond to such groundless allegations. They argue that there are a lot of stories around multiple personality disorder. They also point to the fact that Cartoonist Lee has not identified specific and detailed similarities other than the fact that the two dramas are airing around the same time. The response from viewers has also been varied. Part of Korean viewers believe that this is just Cartoonist Lee making a big deal out of nothing. They point to the fact that multiple personality disorder romances have been around for a while since the original birth of Hyde and Jekyll. Additionally, some people people point to the Hollywood film Me, Myself, and I as an example of the hackneyed premise of romance with a man suffering from multiple personalities. Others have argued that this is a time to start reviewing the drama community for plagiarism, which is rampant. For example, TVN’s drama, Reply 1994 was premised on the same theme as Michiru Yagumanha’s Japanese drama. 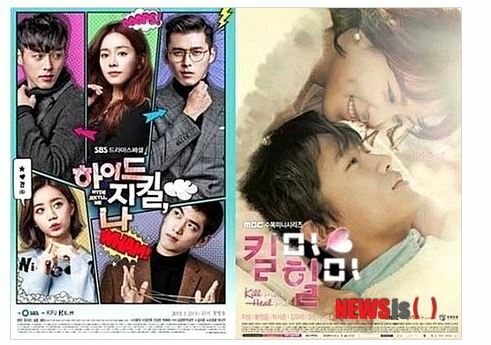 Additionally, MBC’s drama Best Love was also accused of plagiarism after it aired from a romance novelist. It’s true that there have been issues of plagiarism and idea borrowing in the drama world for a while. I think regardless of what happens to this situation, the Korean legal community or broadcast regulations agency should establish a standard for evaluating such issues as well as a resolution process. It’s not fair that the original authors of great ideas should not get credit or financial compensation for what ends up being a lucrative drama. DISCLAIMER: Information was taken from Chosun. However, the views expressed in this article are not endorsed by any news outlet or Wikipedia and are solely the musings of DRAMAFEED.